HVAC Vacuum Pumps are highly engineered speciality equipment designed to remove all oxygen and vapours from a sealed system. As refrigeration and air conditioning systems have evolved, the demand for a better controlled higher vacuum has become the standard with new OEM systems. Those new to the HVAC industry would be forgiven for thinking any vacuum pump is fine, but there are several factors to consider before making a purchase. The quality of the vacuum can depend on the manufacturer and your budget. Just as there are many reputable brands, there are those that should be avoided. Due to the nature of vacuum pumps, it stands to reason that many will be keen to obtain a pump that is reliable and tailored to their needs. Using a company specialised in the vending of vacuum pumps not only ensures that you’re choosing from reliable pumps, but you can also seek further advice should it be needed. This can include advising what type of pump will suit your need, as well as ensuring the pump is able to contend with the task at hand. There’s also the maintenance of the pump to consider. Evidently, the more spent on a vacuum pump the more high-end the product will likely be. So investing in the right equipment also ensures that finding replacement parts isn’t a hassle. If you are in Air Conditioning, Refrigeration or Engineering and require speciality pumps then it’s important to ensure you’re investing in the right type of vacuum pump. It is important to know that vacuum pumps are designed to move air or vapours, and not to directly pump liquids or solids. Moisture is turned into a vapour by the vacuum pump as it reduces the atmospheric pressure. The use of HVAC vacuum pumps is essential for those who work with any form of ventilation, as not only do they prevent freeze-up and the creation of oil sludge but can also ensure corrosion is kept at bay. There’s not a singular product available that will suit every person, as parameters need to be determined. This can include the size of the application. Small flow rates are ideal for small application, but those with bigger areas will need a higher flow rate. An example of how flow rates work are set out below. Although some of these vacuums may not be relevant to your industry, it does give you an idea of the options available. Knowing which suits your needs best allows you to make a short list quickly. Low Vacuum: Generally used for the movement of liquids via filtration. Medium Vacuum: Used for solvent recovery and recondition solvents. Medium – High Vacuum: A wide variety of uses, including botanical extractions. High Vacuum: Used within the semiconductor industry and optics. Ultra-High Vacuum: Widely used in theoretical applications. Those looking for a vacuum pump will also need to ensure that the pump they buy is made from the right material. For example, if the pump will be in contact with corrosive or acidic vapours, then a pump constructed from stainless steel would be advisable. The pumps on offer from HVAC TOOLS are manufactured by reputable brands, while still being affordable. As HVAC TOOLS only deals with reputable manufacturers, customers can be confident that they’re purchasing a robust and reliable vacuum pump, regardless of the application. First, you will need to think about how much free air you are needing to replace, small split systems tend to only need smaller vacuum pumps (45 litres per minute), while commercial cooling and refrigeration facilities can require anywhere up 250 litres a minute of vacuum. Most refrigeration systems can be brought down to a low vacuum in under an hour. Most refrigeration engineers and air conditioning systems require a vacuum of less 50 microns to operate according to the manufacturer specifications. Not all vacuum pumps are designed to pull a vacuum to this level so make sure you check before purchasing. The use of refrigeration vacuum pumps is commonplace when dealing with units that have been in operation for several years. Although there should only be refrigerant and oil circulating, there can be times when air enters the system. The type of air often includes nitrogen and moisture, which contributes to higher discharge temperatures as well as corrosion of parts within the unit. When a repair is being carried out, it is commonplace for the technician to recover the refrigerant, so it can be replaced following the service. This is important due to the high cost of refrigerant replacement. The vacuum pump is used to remove moisture before a charge takes place on an air-condition unit. As the pressure is lowered to below atmospheric, the water vapor will vent off. Industrial Vacuum Pumps have a key difference to other refrigeration vacuum pumps in that they often run for extended periods or continuously. Creating a vacuum creates a large amount of heat as a by-product of the vacuum pump, so specially designed industrial vacuum pumps will be required that can operate for 4+ hours. These may not be portable or light, however, will easily run for several days and only require an oil change with high-performance vacuum pump oil between uses. Industrial vacuum requirements often mean that your system is going to need a lower vacuum of between 0.01 – 0.15 microns, we recommend confirming your ultimate vacuum in microns before purchasing your next industrial vacuum pump. Industrial vacuum pumps applications include ammonia and specialised high vacuum requirements. There are however other factors to consider when making a vacuum pump purchase. For example, as well as being easier to use within manufacturing, many will also want to ensure that the product they are using is clean and environmentally friendly. As many businesses employ the use of vacuum pumps, it should come as no surprise that there are many different pumps available depending on the type of industry you operate in. The purchase of a vacuum pump will incur a cost, but you should always ensure that you’re not forfeiting quality for a cheaper price. It may seem up to the job initially but using the wrong type of pump not only makes the job harder but, in some instances, could be dangerous. Given the many applications, sourcing an industrial pump could be more complex than searching for a vacuum pump for refrigeration. In some instances, it could mean that you may have to invest in more than one pump, depending on the service you’re offering. For those purchasing a vacuum pump for the first time, may find the options available a little confusing, but don’t worry. HVAC Tools not only has many options available but also has the experience to match, meaning that regardless of how complex your requirements are, HVAC tools can help. Laboratory Vacuum Pumps are designed to operate to a higher vacuum and exposure to chemicals. Laboratory vacuum pumps tend to be both more expensive to buy and more expensive to maintain. Common oil-free vacuum pumps used in laboratories are piston and diaphragm pumps or scroll pumps. Diaphragm pumps operate with a pulsing motion and so need no oil as a seal. Valves open and close in an alternative motion to move vapours in the right direction to create a vacuum. Diaphragm pumps have a physical vacuum limit of about 500 microns, and so models are available that can handle all suction applications, as well as evaporative applications for virtually all solvents at room temperature. The collection of samples for gas test chambers. To provide negative pressure to ensure that hazardous samples don’t escape. Providing suction to allow for filtration or suspended samples. Inducing and controlling solvent evaporation. Like any form of pump, it’s essential that you’re investing in a laboratory vacuum pump that suits your requirements as well as your budget. The right investment will provide a lab with more convenience and productivity. Similarly, choosing one not suited to the task at hand could mean that your efforts are hindered. We stock a large range of vacuum pumps in our Auckland, NZ warehouse and can deliver a vacuum pump to you quickly with hassle-free returns. Many of our clients are out on the road and don’t have time to drive to a trade store in the main NZ centre, so we offer free express delivery nationwide. Our preferred courier is NZ Post / NZ Couriers however this does change and any orders after 3 pm are dispatched the following day. Industrial Vacuum Pumps due to weight cannot go on standard courier. Those who are unsure of how big the vacuum pump can be can estimate how much cubic feet per minute requirements can look at the tonnage of the application and note the square root of that number. This will determine how much CFM is needed to work with the application. As a guide, a residential vacuum pump will generate 4-5 CFM. You will also need to ensure that you’re using the right number of microns as advised earlier. All vacuum pumps supplied by HVAC TOOLS are delivered from within New Zealand, meaning that customers aren’t waiting weeks for delivery. This ensures that a professional can back to business sooner rather than later. 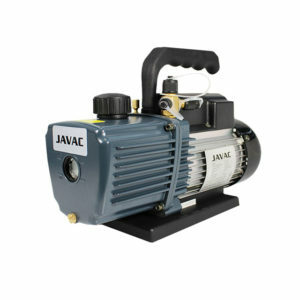 HVAC TOOLS is a proud distributor for JAVAC Vacuum Pumps in NZ, JAVAC is a proud manufacturer of the high-end vacuum pump and has many vacuum solutions. If a JAVAC vacuum pump doesn’t meet your requirements, then don’t hesitate to get in touch with HVAC TOOLS today. Although we may not have the product you’re looking for in stock, our years of experience within the industry means that sourcing what you’re looking for shouldn’t be an issue. HVAC TOOLS can also offer advice as to what’s available around your budget and explain the comparisons between other products. Not only is HVAC TOOLS your one-stop shop for vacuum pumps in New Zealand but can also offer accessories and products that contribute to the long-term life of your device. If you have an idea of what you’re looking for but are looking for some additional advice or assistance, then contact us today. Regardless of the type of vacuum pump you purchase, you will need to ensure that you’re using the right type of oil. The job of the oil is to ensure that parts are lubricated, as well as combating corrosion and contaminations. It’s important that the oil is changed regularly as the vacuum process will generally capture contaminants in the oil. Leaving the oil in for long period of times could mean that the air pump is not working to the best of its ability. Much like the purchasing of a vacuum pump, the quality of the oil can depend on the brand. It is recommended that you use JAVAC high-performance oil, which is refined for use in all vacuum pumps. As well as being able to offer advice on vacuum pumps, HVAC TOOLS know how to keep a vacuum pump working at its best, which is why we only stock accessories that contribute to the running of the machine, and not an inferior copy which could cause more harm than good.